Velikost tohoto náhledu: 442 × 599 pixelů. Jiná rozlišení: 177 × 240 pixelů | 354 × 480 pixelů | 663 × 899 pixelů. 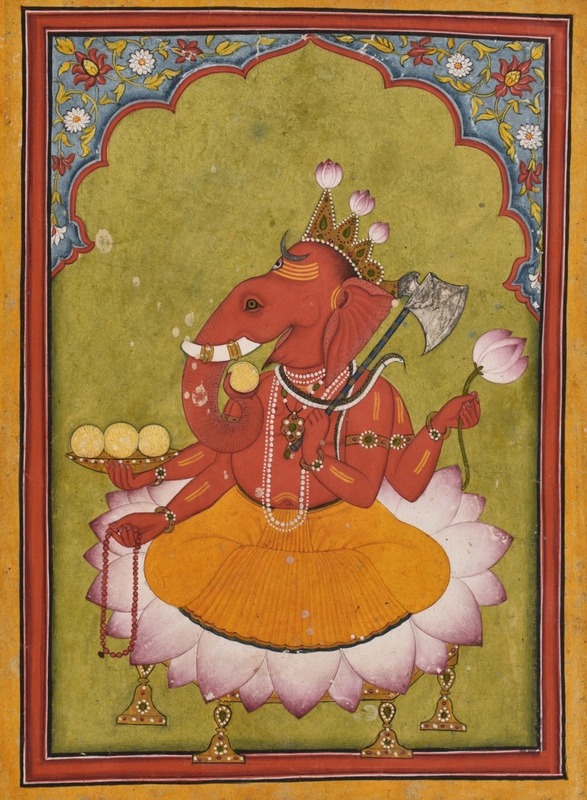 English: Ganesha getting ready to throw his lotus. Basohli miniature, circa 1730. National Museum, New Delhi. Source: This work is reproduced and described in Martin-Dubost, Paul (1997). Gaņeśa: The Enchanter of the Three Worlds. Mumbai: Project for Indian Cultural Studies. ISBN 81-900184-3-4, p. 73, which says: "Attired in an orange dhoti, his body is enitirely red. On the three points of his tiny crown, budding lotuses have been fixed. Gaṇeśa holds in his two right hands the rosary and a cup filled with three modakas (a fourth substituted by the curving trunk is just about to be tasted). In his two left hands, Gaṇeśa holds a large lotus above and an axe below, with its handle leaning against his shoulder. In the Mudgalapurāṇa (VII, 70), in order to kill the demon of egotism (Mamāsura) who had attacked him, Gaṇeśa Vighnarāja throws his lotus at him. Unable to bear the fragrance of the divine flower, the demon surrenders to Gaṇeśa." 16. 4. 2012, 04:36 663 × 899 (970 KB) Gabriela Ruellan Automatic colour & contrast calibration.